Former Gov. 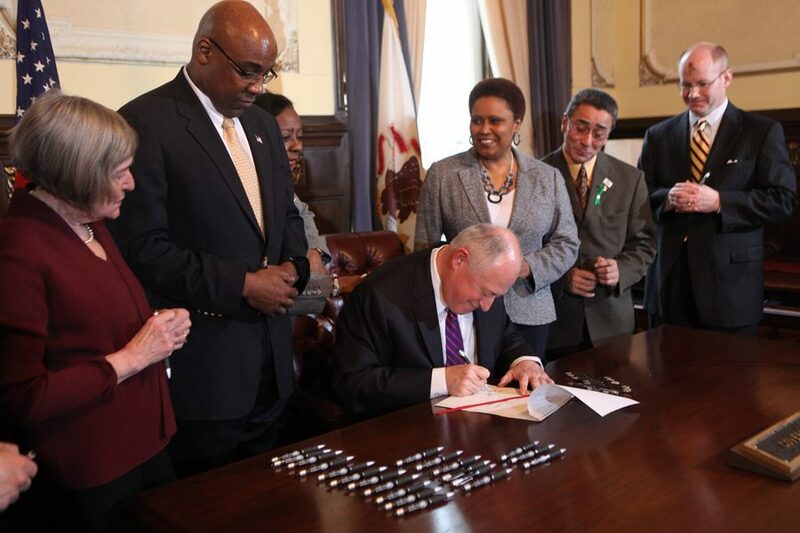 Pat Quinn, center, signs into law a bill in March 2011 in Springfield with Kwame Raoul beside him. Raoul won the Democratic nomination for attorney general on Tuesday. Former state Sen. Kwame Raoul (D-Chicago) won the crowded Democratic primary for attorney general on Tuesday. Raoul won about 30 percent of the vote, just ahead of former Gov. Pat Quinn, who took about 27 percent. The two were seen as the frontrunners in the race. Raoul beat out seven other candidates aiming to fill current attorney general Lisa Madigan’s seat. After serving for 16 years, Madigan announced in September that she would not seek re-election. Raoul, a Chicago resident and son of Haitian immigrants, said in his victory speech that he will fight for immigrants and the rights of LGBTQ+ foster parents. Raoul was endorsed by the Cook County Democratic Party and the Chicago Teachers Union. His campaign focuses include gun control and criminal justice reform. At a January community forum, Raoul said working across the aisle to meet his goals was part of his reputation. “Law enforcement reform, criminal justice reform — (my opponents) talk about this generally, but I talk about this from the standpoint of having passed numerous bills focused on criminal justice reform, numerous bills focused on law enforcement,” Raoul said. Raoul will face off in November against Republican Erika Harold, an attorney who won that party’s primary.